I’m always looking for simple and easy to sew ‘pin cushion’ projects. Because I really LOVE pin cushions! Being a huge fan of wool felt, I love making anything with this amazing medium. 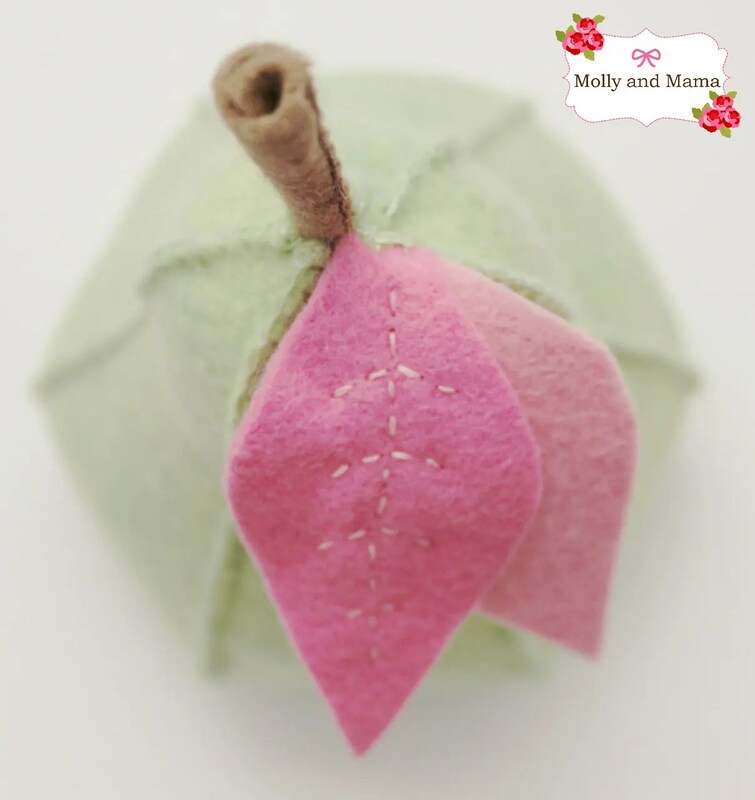 This pear pin cushion was a fun sew. I even added a sweet little birdie pin. 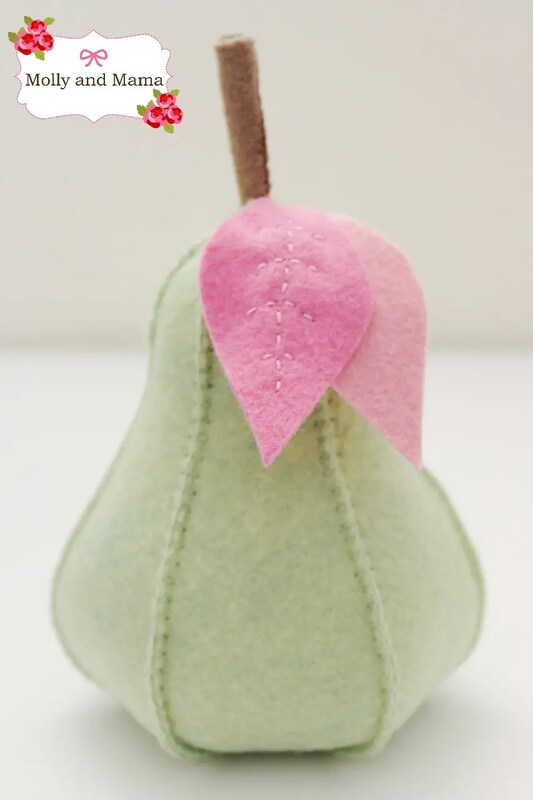 In the process of ‘researching’ on Pinterest, I came across a free template for a felt pear. It was included here with a tutorial, as I couldn’t find any details to credit the designer of such a cute pattern. However, it was very kindly brought to my attention that the template was actually from Heather Bailey’s gorgeous pattern ‘Fresh Picked Pin Cushions’. Now I’m all about supporting hand maidens and their hard work, so I’ve altered this post, and removed the pin cushion instructions. I’d much rather you support Heather and purchase her pattern HERE. Heather’s pear is made with fabric, but you know me and felt!! Here’s a few images showing the details of the pin cushion I made. After I finished making this pretty pin cushion, I decided that something was missing! So I thought it best to create a special little decorative pin to go with it. 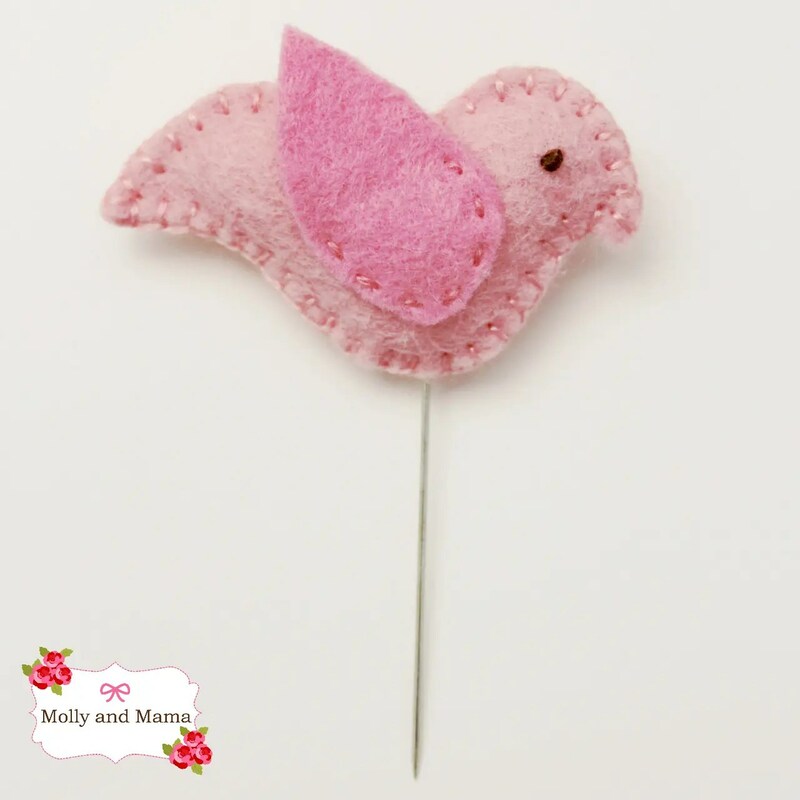 This little birdie is tiny, but very simple to create. 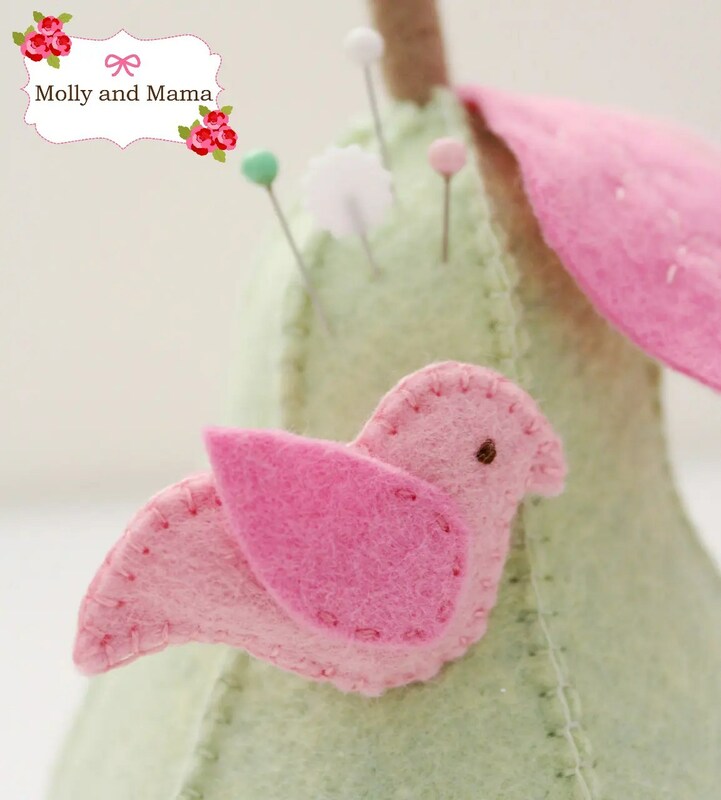 I simply cut out two birdie shapes in pale pink felt and two matching dark pink wings. Using two strands of embroidery cotton, I straight stitched the wings onto the outside of the two matching body pieces first. (Be sure they are placed in the same position and match up on both body pieces.) I created the ‘eyes’ by stitching a french knot on each piece with chocolate thread. I then pinned the body pieces together and blanket stitched them, starting at the base of the bird shape (where the pin would go). When I had a 1/2 inch left of stitching to go, I used the tip of the scissors to manoeuvre a small amount of stuffing inside. I popped the head of one of my pins inside too, and continued to blanket stitch up the seam. I secured my threads well, and my little birdie was ready for her new home. Completing this project really got me thinking about working with wool felt. I’ve shared my favourite tips HERE. I also got thinking about other cute pin toppers that could be hand stitched for pin cushions. I created an adorable mini cloud one to go with the Sleepy Cloud Pin Cushion Pattern. The Mini Cloud Pin Topper is a free tutorial too! For more Pinterest inspiration visit my Pin Cushions and Plushies board. Follow along if you like, because there’s so many creative people out there, who make such wonderful things! And I love finding them all for you! You can sew Miss Molly too. See her instant download pattern HERE. That is really cute! I love the bird. Thanks Jessie! I like the bird too! ah, i like that! so much detail, especially the little birdy. thanks for sharing! Thank you Stacey! I’m dreaming up some new felt pin toppers now. So hopefully I’ve have more to share soon! Super cute. Great for some summer decor. Thanks Chelsea! A whole bowl full would be cute, wouldn’t it? Super sweet little pear, Lauren! Thanks Maris. I loved this project! Oh my gosh. Just adorable! Thanks for the tut & pattern- I’m pinning g it! You’re welcome Amy. It’s a terrific tutorial to pin for when you need a portable project! Sew cute! Mine would never be that neat. Thanks. It just takes a little bit of practise! You do beautiful work. Thank you so much for sharing. Thank you Nancy. That’s so kind! Thank you for your lovely comment Nancy. It’s so lovely hearing from readers! Great idea Val. A cute way to keep your needles sharp, for sure! Very Sweet! I’ve totally got stitch envy 😉 Just lovely stitching! Thanks Jackie, but your stitching is impeccable. And your work is lovely! Thanks for the feedback! 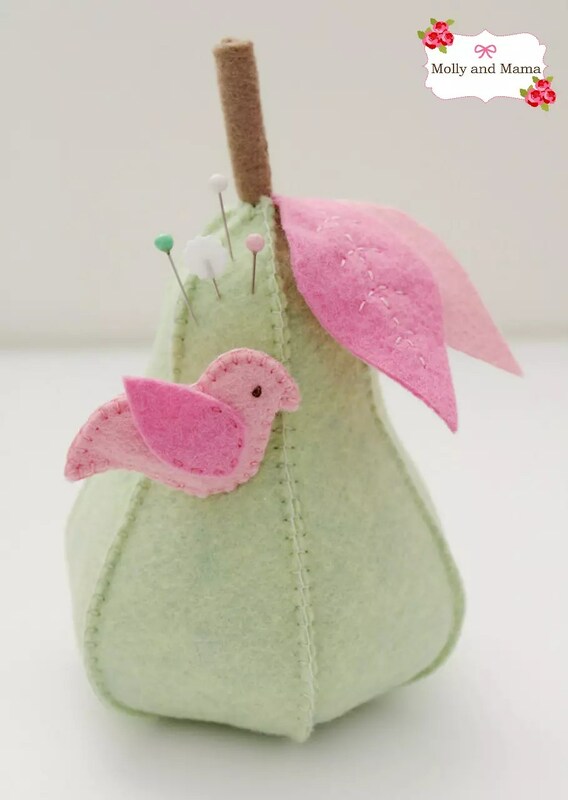 Sweet pear, Love, Love the little birdie. Thank you Melissa. I love the birdie too! Love the pear pin cushion. What beautiful stitching you have, it is so even. Thank you for sharing. Thank you for your lovely comments Lynette! Enjoy the tutorial. Really cute pin cushions. Time to make a few for gifts Thank you. You’re welcome Mary. I’m glad you liked them. I was suprised how big it was. I thought it would be smaller. It is cute though. I made mine in two colors of pink and just one green leaf. I wish I had looked up how to blanket stitch but I was too excited to try and make it I just stitched it the old way. It still looks cute holding my pins. I made the bird before I finished the pear so it is tiny so I am still needing to make one again the right size. Thanks so much for sharing your feedback. It’s funny the simple details that we easily overlook when writing tutorials. I’ve added a bit of feedback about the template size and how it corresponds to the finished size, so thanks for your input. I’m just picturing your pin cushion with a whole flock of birds on it. How gorgeous! And your colour selection sounds lovely! Thanks for your lovely feedback Sonia! Thank you for sharing the sweet pear pin cushion. Pears are such a great color & shape — one of nature’s great treats for the eyes.